Hello Kofi, want a cup of coffee? "No thank you, I'd prefer a cup of tea". I can't count the number of times I get offered a cup of coffee. I guess my name Kofi has something to do with it. I have nothing against coffee. Trust me. I actually like the smell of coffee but I get very nauseous and uncomfortable when I take even a sip. So by default, I love tea. This photograph is part of a series of advertising photographs I'm making for my portfolio. 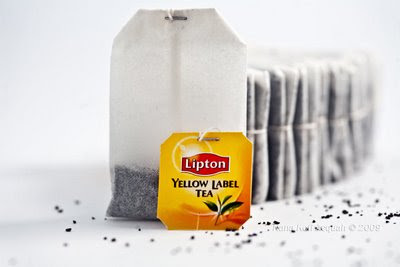 I chose Lipton because we have a past. I used to be a creative person on the account some years back. For those interested in making a similar photograph, this was made with a Canon 5d and the EF 100 Macro. The photograph was lit with two speeedlites both off camera and triggered with an ST-E2. Of course the product was set up in a cocoon.